A hooded and blurred figure on screen warns us: there is a demon running loose and we should join the resistance to counter it. To prove its existence, the figure shows us a hidden recording of the night it all began, introducing to the audience the main plot of the film: while on a four-way Skype call, former college friends who try to reignite the old days of their friendships by pranking one another, unwillingly break a powerful demon free from its trap. 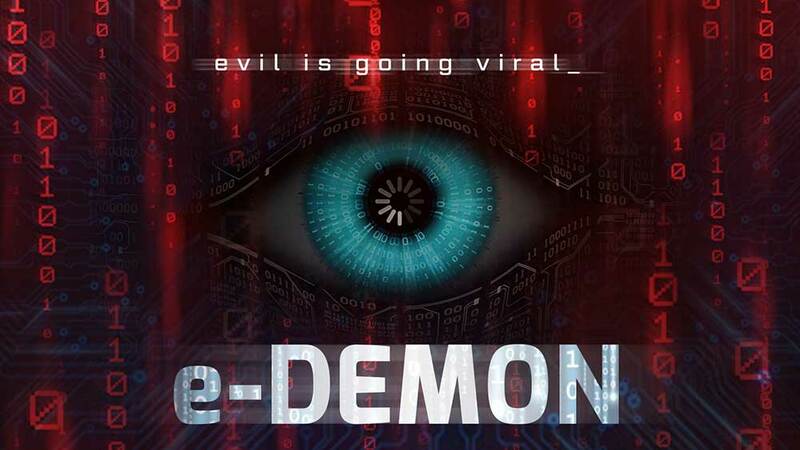 Like Unfriended, the 2014 movie by Levan Gabriadze whose sequel came out this year, E-Demon is from a subcategory of the found footage genre, the one in which the audience is staring at a computer screen from start to finish, privy to the Skype calls, private messages and web searches of the characters. But while Unfriended was mostly static, using only webcams attached to the computers to follow the characters, E-Demon offers a wider range of motion with headsets that allow the characters to travel inside their homes and even outside. Additionally, none of the characters are hanging completely alone and locked in their room: a various gallery of people take turns sharing the small Skype screens, with the point of view even regularly switching between two computers. This constant dynamism avoids the inherent boredom of the genre, where staring at a computer screen for more than an hour quickly becomes dull. Here, there is always movement, constant dialogues to follow, and new places and characters to see throughout the runtime. The plot itself is very dynamic as well. The college friends – children’s book writer Kendra, Julia Kelly (“Forever Into Space”, “Pink Moon”), rich and arrogant A. J., Christopher Daftsios (“Royal Pains (TV)”, “Law & Order (TV)”), family man Dwayne, John Anthony Wylliams (“Sure-Fire (Short)”, “Suddenly Rich (TV)”) and prankster Mar, Ryan Redebaugh (“Crashing (TV)”, “Frenemies (TV)”) – all have strong personalities and enjoy messing with one another. Characters set up elaborate pranks that fool their friends as much as the audience, setting up the tone for the first part of the movie: what of what we see is real and what is just a joke between friends? As the demon then starts roaming around, the film shifts to another question: which characters are possessed and which ones are clear-headed enough to stop the threat? The mythology around the demon is given a lot of thought as well as an original modern twist. Unfortunately, this mythology involves some expository dialogue that feel a bit out of place, just like the framing device that actually doesn’t have much purpose other than add unnecessary exposition. As for the scares, the film will probably mostly leave you cold. There isn’t enough tension to truly create a scary atmosphere, and the realism of the found footage trope is cheapened by some of the reactions of the characters towards certain events as well as some dialogue that is too unrealistic. Despite this, the film is still engaging and doesn’t entirely fail its horror premise – it will just make you quiver a little instead of really quake with fear. E-Demon ends up a mostly fun horror movie that may be lacking in some crucial parts but gains in originality, pushing the found footage genre to slightly new and more modern territories.